Stopping by Woods - take in the lovely wooded scene, blanketed in near-silence, and be tempted to stay just a little bit longer to watch the deer grazing among the trees or contemplate nature and all its mysteries. The warmth and smell of wood-burning is sure to make you feel at right at home – where else would you rather be when the weather turns chilly. 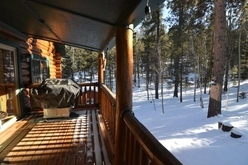 A place surrounded by pine and aspen where a cozy log cabin awaits. An authentic log cabin with all the extras …. a main floor with a wood-burning fireplace, an open great room, kitchen dining area, bedrooms and bath, upper loft game and media room, master suite w/ fireplace and private bath, and a lower level bedroom, bath and family room. Tastefully decorated, comfortable and accentuated with earth tones; and, plenty of space to accommodate more than a few family and friends. The oversized garage and storage shed provide plenty of space to tackle a variety of hobbies or projects. The woods have always been a place where life renews and thrives – here, you can feel yourself take a deep breath and relax. Sipping a glass of wine or hot cup of cider cozied up next to a fireplace, on the spacious covered wrap around porch, or gathering around the outdoor firepit sounds pretty sweet, right? Flagstone pathways, stone firepit, sitting benches, colorful pine and aspen can be enjoyed during the Spring, Summer and Fall. Stopping by Woods will make you feel worlds away but in reality, it is only a short 10-minute drive to modern-day necessities. Access is via from County maintained roads, only 0.3 miles from the pavement.